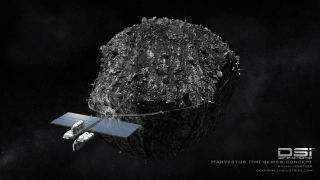 Artist's illustration of Deep Space Industries' Harvestor-class spacecraft for asteroid mining. Right now, he said, spaceflight and space science is unsustainably expensive. But asteroid mining could play a critical role in making those endeavors doable on a smaller budget, as private companies like SpaceX have decreased the launch cost per pound of payload. But asteroid mining will face a critical problem, Elvis said: How to choose which asteroids will be worth the trip. And astronomers can play a crucial role in that determination, he said. "The problem with asteroids is not many of them are valuable. You've got to find the right ones," he said. "We want to throw away that gray, stony stuff and deal with the carbonaceous or metallic ones, depending on whether you're looking for water or precious metals like platinum and palladium. So, this is where we [astronomers] come in." As an example, Elvis pointed to the twin Magellan 6.5-meter telescopes in Chile. Professional astronomers could use telescopes of that size to characterize a faint asteroid in about 1-2 minutes. Eighty-five percent of asteroids could be thrown out based just on their color, he said, and the remaining 15 percent would be good prospects for sending small, exploratory probes using the data gathered about the objects' orbits and sizes. Even a few nights per year would allow for the characterization of about 300 such objects, he said. And as larger telescopes come online, like the European Extremely Large Telescope and the Giant Magellan Telescope, the midsize telescopes could become more accessible for even more space-mining projects, he said. "This means astronomers can turn out to be useful again — [like] what [they] used to be, back in the days of navigation," he said. Similar to modern-day mining on Earth, there could be a multistep process of prospecting remotely — "you don't just go straight to start digging rocks" — before making a trip, Elvis added. Such a process could cut asteroid prospecting costs by a factor of 10, he said. That would allow asteroid mining to flourish, lowering the cost commercially to put people and science in space. So far, Elvis has talked to the asteroid-mining companies Planetary Resources and Deep Space Industries, but neither company initially believed that this kind of remote prospecting would be necessary, he said. "Both of them are dominated by engineers who are very good at building small spacecraft, and I'm sure they will succeed at building interplanetary cubesat-scale spacecraft for prospecting at the asteroid, but they were initially unbelieving of what I just told you," Elvis said. They might come around, though, he added. "One of the companies did eventually realize that this was a necessary precursor to their sending out satellites," he said. "The other still isn't interested."